1 What is Fifteen Ball? Fifteen Ball is a basic game variation similar to Rotation Pool. It is not a “pocket call” game like the game of ﻿8-ball and 9-ball. The game requires accuracy in shooting the designated object ball, which is always the lowest valued ball on the table. Just like in Rotation, a legal shot is scored according to the numerical value of the ball that was shot. 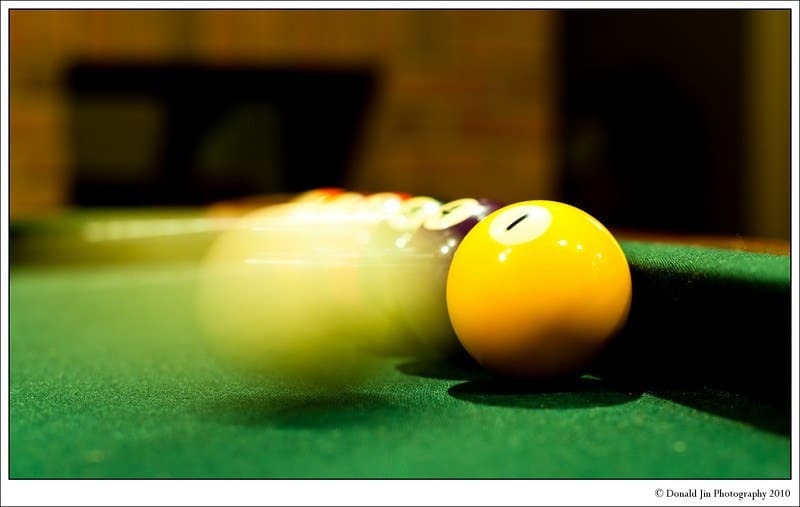 The game of Fifteen-Ball Pool is a wonderful game for beginners to practice on. But nonetheless still enjoyed by intermediate to advanced players. In the game of 15-ball, players are required to shoot balls on the table to boost their score strategically. Accumulating points until a player or a team reach the predetermined goal score. Two player or two teams could play the game. Standard set of fifteen balls and the cue ball. Balls are organized using a regular triangle rack. The money ball, which is the 15 ball, is at the foot spot (apex). The remaining balls could be placed at random. Although, the higher numbered balls should be in front of the rack. Therefore making it more challenging to pocket the 1-ball on the break shot. Actually, it could affect even the first few plays of the game due to first object ball’s position. 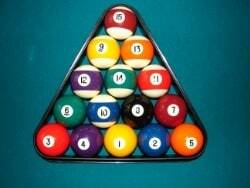 To rack for Fifteen Ball, the 15-ball must be at the apex. while the lowest valued balls must be kept at the far end of the triangle. Legally pocketed object balls have poin﻿﻿t﻿﻿ values equivalent to its numbe﻿r. The game ends when a player or team’s total points makes it impossible for the opponent/s to catch up. The standard score for fifteen ball is 61, whether for a two player or two-team game. When two or more players tie with the highest point total, the player who pocketed the last ball wins the game. Make the cue ball contact an object ball while the cue ball and two other object balls must contact the cushion. This photo represents the sequence in shooting balls when playing Fifteen Ball. The first object ball is the 1-ball trailing off in a consecutive order from one to fifteen. Photo Courtesy of Donald Jin Photography. Failure to do the aforementioned results in a foul. Please see below for more information about fouls and penalties. After a scratch, the following player will have the cue ball in hand behind the head string. In the event when all object balls are behind the head string as well. The object ball nearest the head string may be spotted on the foot spot upon the player’s request. In another case, two balls equal in distance from the head string the player may choose to have the ball spotted. All balls that sink into a pocket due to an unauthorized or illegal shot is spotted. The ball is simply spotted, and no other penalty is given. Incoming player has cue ball in hand behind the head string. In Fifteen Ball, an offender is penalized by deducting three points for every foul committed. After fouls, except for a jumped cue ball or cue ball scratch, the incoming player accepts the "t﻿﻿able in position." Which simply means balls are unmoved and remains as how the previous player left it.